Munich - Scratch beneath the surface of any team worth its salt and you will find that one unwavering trouper determined to go the extra mile. 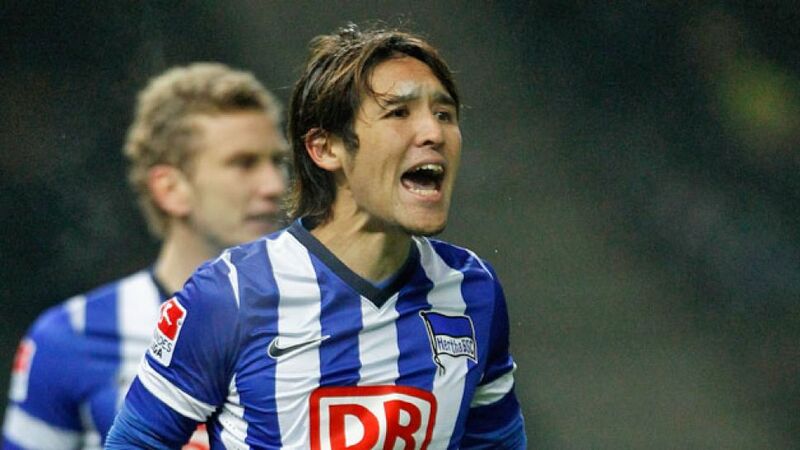 For Hertha Berlin, that man is Hajime Hosogai. The Japanese midfielder has enjoyed a new lease of life following his summer move from Bayer 04 Leverkusen, taking the capital club to Bundesliga heights not seen since those heady days of Lucien Favre’s class of 2008/09. With one fixture left to play before the German game goes underground for the winter, club captain Hosogai can begin to look back on the Hinrunde with a great sense of satisfaction. After 16 matches of the 2013/14 campaign, last season’s Bundesliga 2 winners - bound by their ever-present midfield major - already have 25 points on the board (W7, D4, L5), with only FC Bayern München, Leverkusen, Borussia Dortmund, Borussia Mönchengladbach and VfL Wolfsburg boasting a higher return. To put that into context, five years ago at the same juncture of an unforgettable season that culminated in a surprise fourth-placed finish, Hertha had 28 points to their name. By the same token, after picking up just 19 points from their first 16 outings of 2011/12 (W4, D7, L5), die Alte Dame went on to record just three wins (Matchdays 17-34) and spent the ensuing nine months or so soul-searching in the second tier. Evidently, they are not safe yet. Indeed, if Jos Luhukay’s men are to avoid a repeat dose of the aforementioned post-winter blues, Hosogai, for one, believes his side can ill-afford any more first-half stutters, as witnessed in last weekend’s eventual 3-2 win over struggling SV Werder Bremen and in Matchday 15’s ultimately successful trip to fellow promotees Eintracht Braunschweig - albeit to a far lesser degree. "Just like against Braunschweig, we got off to a bad start," recalled the 23-time Japan international in light of a topsy-turvy encounter that saw Berlin bounce back from an early setback to record their first set of back-to-back league wins of the season. "We were in control as we started to turn the game, but conceded a second far too easily. It’s no good giving away goals like that [...] We needed to win. It’s great we took all three points." Were it not for an enforced reshuffle, however, Hertha may have been looking at an entirely different scoreline altogether. With the hosts teetering on the brink after Bremen had made it 2-2, an injury to John Anthony Brooks took Hosogai from his favoured holding midfield role into uncharted territory at centre half. Making a near-seamless transition, the former FC Augsburg loanee did not allow his side to fall victim to the same mistakes again. Hosogai’s next assignment, Hertha’s final game before the winter break, takes him to Borussia Dortmund. A Matchday 5 victory in the club’s last trip to the Signal Iduna Park back in September 2011 proved nothing more than a false dawn, but with the stabilising and indeed versatile attributes of their Japanese jewel, as well as the goals of Adrian Ramos and Ronny thrown into the pot, Hertha now have all the ingredients in place to make their recent return to German football’s high table permanent.